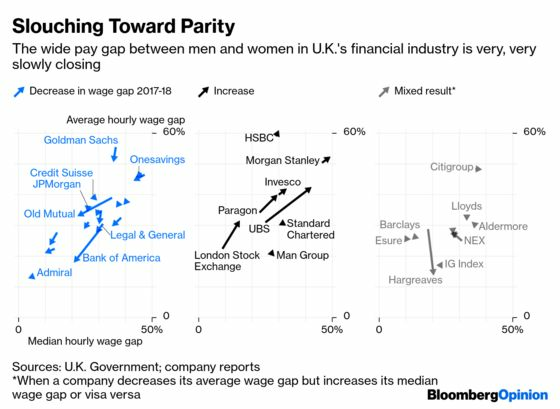 (Bloomberg Opinion) -- For a second year companies have published their U.K. gender pay gaps. In financial services, there is a glimmer of improvement. True, women earned 26.3 percent less than men on average in 2018, a worse showing than last year’s 25.7 percent, Bloomberg News reported. This result covers a broad range of companies and multiple reporting entities from a single firm. 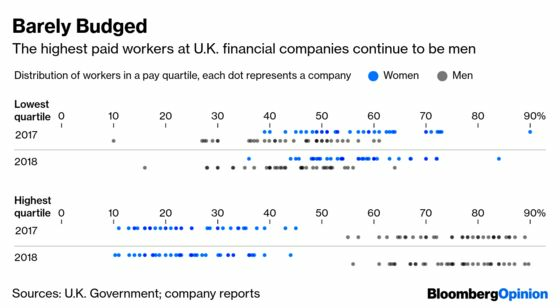 But a subset of the largest companies showed the number reporting an improvement exceeded the number reporting a worsening gender pay gap. Bank of America Corp. and Old Mutual Ltd. made the biggest gains, while the London Stock Exchange Group Plc and UBS AG did the worst. One reason the wage gap persists is that more men are in higher paying positions. A comparison between the lowest and highest pay quartiles show that distribution is stubbornly static. One year isn't significant for measuring long-term change. But it's a starting point. And when the starting point is so egregiously skewed toward one group, firms can't be allowed to drag their feet on putting things right.